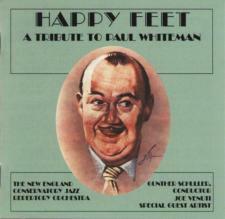 It is unlikely that anyone in jazz history has been as consistently maligned as Paul Whiteman. This recording hopes to put Whiteman's contribution to jazz in proper perspective and, by paying tribute to him, right the wrong which has been perpetuated far too long. For decades jazz writers have propagated the myth that, except for Bix's (and a few of Tram's) solos, none of the Whiteman recordings -- of which there are hundreds -- are worth hearing; that Bix suffered intolerably in the Whiteman band; and that Whiteman's concept of "symphonic jazz" and his attempts to "make a lady out of jazz" were a betrayal to the music. A favorite target of jazz writers has been the use of violins, for this is where the real betrayal of jazz is alleged to have occurred. Bosh! to all of that. The Whiteman orchestral sound, as fashioned by three of the greatest arrangers that ever worked in the field -- Ferde Grofe, Bill Challis, and the Dean of African American composers, William Grant Still -- is one of the half-a-dozen most original jazz sounds ever to have been created, and it provided the perfect setting and inspiration for Bix: like a jewel set perfectly in the center of a crown. In its own way the Whiteman sound is as original and as beautiful as that of Duke Ellington's orchestra -- very different, of course, but no less magical, no less inspired. And let no one forget that Ellington and the other great jazz orchestra leaders of the late 20's spent a great deal of time learning from the Whiteman "book", emulating it and marveling at its instrumental sophistication. "Gunther Schuller leads an exceptional ensemble of students from the New England Conservatory on this program, with a guest appearance by the great jazz violinist Joe Venuti...the album is a complete pleasure. Perhaps its reissue will help a few of Whiteman's more vociferous critics to moderate their views." New England Conservatory Jazz Repertory Orchestra; Gunther Schuller, conductor; Joe Venuti, special guest violinist, on trks 6 & 13 only.